Tomorrow I’m heading to Bocas del Toro, Panama. It’s mostly a work trip, but I’m counting it as vacation too! I will be gone for 7 days and 7 nights. This fabulous, exciting trip is happening smack dab in the middle of my 14 week Sprint distance triathlon training program. In fact, I will be away from my home for Week 8 of my training. Step 1, remind yourself that life happens. This interruption is okay. Take a deep breathe and calm yourself down. Step 2, consider if you know about this interruption in advance. If you do, see if you can review your training protocol and make adjustments. That’s what I’m doing in regards to this exciting Panama trip. I reviewed the work out plan for Week 8 in my training program, and I highlighted the priorities. I am very doubtful that I will have access to a bike, so I won’t be able to do the one bike session scheduled. I don’t know what the ocean swimming or pool swimming options will be, so I’m not sure I will be able to do the two swim workouts scheduled. I can do the yoga session and the run/walk sessions. 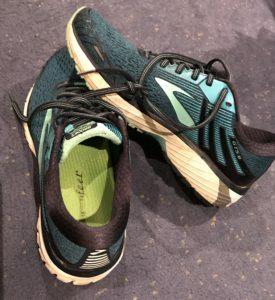 Well, no I won’t, I’m not bringing my run shoes. As you can see, I won’t be doing much of the actual training that is scheduled. It would be super easy to give up. Instead, I’m taking a deep breathe and thinking about what I CAN do!!! 100% I can walk! And likely I can walk A LOT! I’ve mentioned to my traveling companions that I want to prioritize walking and already I know that we have a few big hikes planned. In addition, I can do hotel room workouts every day. I’m known for hotel room dancing if needed! Plus yoga and stretching are always great options. As always when I travel, I will have my bands with me, which provide great in-a-pinch workout options! In essence, the key thing to remember when you go on vacation or have family or friends come to town or otherwise you get derailed, is to non-stop remind yourself that YOU ARE WORTH IT. You and your health are worth prioritizing. In any given day, there can be and there is time for self care. Movement is life affirming and taking 30 to 60 minutes out of a 24 hour day for moving your beautiful body is allowed. On that note, I’m off to get a good night of sleep before the plane takes off! Panama exploration for internships, OH MY! I went to a week long family reunion and used it as a recovery week. There was a massage chair and hot tub, and we went out to the schoolyard and kicked around an Aussie regulation football brought by family from Tasmania. I felt great when we got home. Excellent way to spend your vacation/family reunion week!!! Thanks for telling me/us about your strategy. For the past seven years we have gone on a family vacation with our children and grandchildren (we now have four – two that are three, one five and one seven year old). We all have our own cottages as a good nights sleep is essential for me and I know I will not get that when four little ones are awake at any given moment during the night). We spend all day together and retreat to our nice, calm, quiet cottage at night. I have a Black card to Planet Fitness and can go to their gym in South Yarmouth for no extra charge. I go to the gym every day while I am on vacation first thing in the morning which gives me the energy I need for the duration of the day playing with the grandchildren. I can’t emphasize how right you are when you write we all deserve at least 30 – 60 minutes a day to ourselves. Even if you use some of that hour just to read a book or something to do something besides exercise that makes you happy. Whatever you like to do-just do something for you!! Your comment makes me happy! I was just thinking yesterday that I will miss my workouts for the 6 weeks post surgery when I won’t be able to drive. But I reminded myself of the chair workout you posted earlier. So while I work on my physio exercises, I can still move my upper body! No planned surgery date yet. In the meantime, I am working hard to get as strong as I can. I have managed to ditch the cane, at least in the house! YES YES YES!!!! Exactly!!! The key is to focus on what you CAN do!!! Super smart!!! I darn well greatly appreciate all your comments and wisdom!! Well done! !